Rudds (previously known as Bishops) is a boutique hotel in Lulworth set on the cliff top of the world heritage Jurassic coastline. 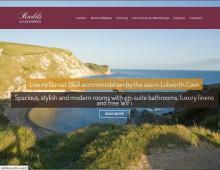 This 4 star Lulworth Cove hotel with pool is an ideal escape for luxury holidays or short breaks. Rudds boutique holiday accommodation consists of three stylish and spacious rooms that are available to reserve. All the rooms offer luxury B and B facilities including chic modern rooms, ensuite bathrooms and luxurious linens. Rudds has a large swimming pool which is located in the gardens overlooking the beautiful Lulworth Cove. Rudds boutique hotel restaurant and bar is open most of the year and offers breakfast, lunch and dinner. Functions can be catered for in the restaurant as a sit down meal or buffet style or outside BBQ pool parties can also be arranged for special occasions. This beautiful Lulworth Cove accommodation is easy walking distance to the cafes, pubs, restaurants and sandy beaches of Lulworth Cove. The area is part of the official Dorset Area of Outstanding Natural Beauty.